Take the guess work out of rebuilding your Yamaha Banshee top end. Full Bore top end kits are returned to you with everything needed for your top end rebuild, including Your cylinders bored to the next available piston size. pistons, rings, pins, bearings, circlips, head gasket, base gasket, exhaust gaskets and intake gaskets. Be sure to scroll down we offer kit's for everyone from the budget minded to the all out racer. For a limited time free return shipping on our Seadoo and Yamaha top end kits to the 48 Continental States!!! Free return shipping on top end kit's purchased here on the website only! If you send your old piston and spark plug, we can usually tell you what caused the failure so you can keep this from happening again. Please note old pistons and spark plug will be disposed and not returned. After we receive your cylinders we will inspect them and determine what oversize pistons it will take to make the cylinders straight. Then bore the cylinders on a boring bar, final size with a precision hone, followed by chamfering the ports and a final hone. For a limited time free return shipping on our top end kits to the 48 Continental States!!! Our top end rebuild kits include everything needed for your top end rebuild. Your cylinders bored to fit. Banshee top end rebuild kit includes Your cylinders (2) are bored up to 0.040" (1mm) oversize. Includes 2 pistons WSM Platinum (molly coated), rings, pins, bearings, circlips, head gasket, base gasket, intake and exhaust gaskets. Banshee standard bore is 64mm. If your cylinders are already at 65mm or need to go more then 65mm they will need to use the WSM performance forged top end kit or Wiseco kit offered below. Stock size piston gives 5 horsepower gain through an added boost port. 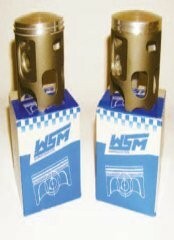 Specifically designed For ported cylinders, these German made pistons realized by revolutionary computerized manufacturing technique coming from GP and F1 racing. Mos2 coating reduces friction and heat for added performance. Also available in 5mm Long rod, & Big bore ($375) design. The kit is returned to you with everything needed for your top end rebuild, including Your cylinders bored. 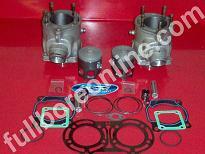 High Performance Banshee top end rebuild kit includes boring your cylinders (2) up to the next available piston size. 2 pistons WSM forged Race pistons, rings, pins, bearings, circlips, head gasket, base gasket, intake gasket and exhaust gaskets. Now only $349 for standard pin height and $375 for long rod +5mm. After making payment with buy it now button, ship your cylinders with a copy of receipt and contact phone number. Free return shipping to the 48 Continental States!!! Accepting credit cards through pay pal, right here on the web site. It's the safe and secure way to pay online. Boring a cylinder needs attention to detail, if it is going to be done right. Here at Full Bore we take every precaution to make sure it is right and will custom size to what your needs are. Our strict quality control policy ensures specifications will be met. The cylinder is bored, sized, and followed by a three stage chamfer to ease the rings back in and increase engine life, and final hone for the proper cross hatch. Send your piston and we will bore your cylinder up to 0.040" oversize to fit. Cylinder boring ..... $75 each. Turnaround time is running 7-10 days on our Banshee top end kits. Placing an order is straight forward. First find what you are looking for and make the payment right here on the website. After making payment with buy it now button, ship your cylinders with a copy of receipt, contact phone #, return shipping address and any special requests. If paying with a cashier check (certified bank check) please contact us at info@fullboreonline.com to let us know it is coming so we can keep it in mind for scheduling. Please note that we schedule our workload by payments received and or deposits. Shipping us something overnight doesn't mean we can do it immediately. If you are in that big of a hurry, be sure to find out our current turn around time before ordering. Wrap cylinders in a plastic bag or plastic wrap. Pad them tightly with crumpled newspaper, dense foam or shipping peanuts. Be sure cylinders are secure and don't move freely in the box causing damage. Insurance doesn't cover poorly boxed items. If you keep your shipping receipt, you can check online to see when it is received on our end via tracking. Please send with signature required. When we ship your cylinders or engine back, you will receive an email with tracking info. If you have a pay pal receipt, please put a copy in with the cylinders or engine. Be sure to include clear instructions for any additional work requested, return address, and billing info, phone # and email address. 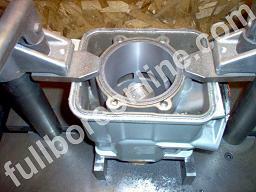 When Full Bore ships your cylinders or engine back, you will receive an email with the tracking number. We no longer ship signature required unless requested by the customer. We will ship to the address provided at the time of payment unless notified in writing on the receipt or from your email address on record with Full Bore.